When I left home for work this morning, there was no reason to think that my day was going to be any more bookish than normal. I had only one book in my bag because I knew that I wouldn't finish the one I was reading today. If there is any chance that I will finish my book I always take a back up just in case, but it wasn't at all necessary. Then around lunchtime I got a text message from someone I know just a little bit (we'll call her A. for the purposes of this post). A. is a friend of a friend really but I did see her on Saturday, and whenever we do spend time together we get along quite well. Anyway, she had purchased tickets to go and see an author event in the city, and the person who was going with her pulled out at the last minute, so she wanted to know if I would like to go. I did think about saying no, but in the event the lure of an author event pulled me in, so I quickly arranged babysitters and said yes. I was already leaving work early to do something in the city. Once I finished my appointment I still had about an hour and a half to fill, so I wandered down to the specialist romance bookstore. A couple of weeks ago I had gone to Borders fully intending to buy three books, and they didn't have any of them in. Today I went to the bookstore looking for those same three books and still no joy! Then I wandered up to one of the bigger bookstores in town to see if they had any of the books I was looking for. They had one of them (Wanderlust by Ann Aguirre), so I quickly snapped that up, had a bit of a conversations with some of the ladies who were in the romance section about the fact that they should really read Elizabeth Hoyt and Lisa Kleypas, a quick bite to eat, and then off to meet A. After a lot of chat about mutual friends and then about various books (I really love talking books), we listened to Irish author Cathy Kelly talk about a few different things - her life, how she started writing, her new book, being friends with several other Irish authors including the fabulous Marian Keyes. 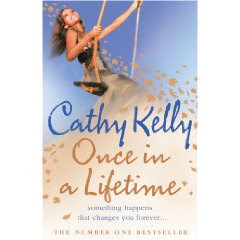 I must confess that I haven't read any Cathy Kelly other than a short story in the Irish Girls About Town anthology so I was probably at a bit of a disadvantage, but she was warm and funny, and so of course I had to buy her new book which is called Once in a Lifetime while I was there, and seeing as she was there, I got her to sign it as well! Funny thing happened while we were in the queue. A. met a woman who she used to know back in country Western Australia a number of years ago. The lady was on holidays in Melbourne with a friend and they decided to come to the event. A. had thought about not going tonight when her friend originally cancelled, but if she had she would never had met this person completely coincidentally! I love it when things like that happened! So I went to work with one book and came home with three. Can't complain about that really! Although I really would love to have got my hands on Angel's Blood by Nalini Singh and The Sins of Lord Easterbrook by Madeline Hunter which are the other two books that I am trying to get hold of at the moment! Never read Marian Keys either. I really like Cathy Kelly, she's a bit like Maeve Binchy, don't know if you've read her either. I can recommend Someone Like You and Best of Friends by her, but I still need to catch up with her backlist. Ana T, I really love Marian Keyes, so the fact that they are friends and there is a cover quote is enough for me to give Cathy Kelly a go. Ana O, I read Maeve Binchy years ago but haven't recently. I have been thinking about it though! Any title by Marian Keyes you recommend especially Marg? I loved Last Chance Saloon and the Walsh sisters books, which I think that it is best to read in order for development. That series starts with Watermelon, which isn't the best of the books but it's still entertaining. My favourite of the Walsh sisters books is Anybody Out There? Thanks, I'll add those to my WL. Wow, that sounds like a dream day...I love it.